« why chinese people aren’t vegetarians. How to win a free ipod: bodypaint. I’d be lying if I said the top model lurking inside of me isn’t sad to have missed the TBB family photo shoot in Thailand. So instead of modeling the new 2XU race kits and bike jerseys, I present to you a prize-winning photo I submitted for my alma mater’s “Most Amazing T-Shirt” contest. As you might know, I went to this super nerdy tiny little college in southern California (a bit over 700 undergrads total). More than a third of the student body were kids that were either valedictorians or salutatorians in high school and everyone was an incredible overachiever. Since it’s basically a science & engineering school, we used to joke that the ratio of men to women was about “pi to one” (which would be almost 76% guys) but these days it’s about 65% guys. The school? Harvey Mudd College. “Mudders,” as we’re called, go on to become geniusly successful overachievers. (Yes “geniusly” is a real word, says me.) In fact, CNBC recently had a list of the top 15 “Colleges That Bring The Highest Paycheck 2011″ and Harvey Mudd topped the list at #1 with graduates making a mid-career median salary of $126,000 and starting median salary of $68,900. HOLY CRAP, I say. Knowing my own salary, and the fact that a good handful of my college friends are still in grad school or med school (those overachievers are getting their PhD’s and/or MD’s, and I’m serious about the “and/or”) we concluded that these salary numbers would actually be much higher without outliers such as ourselves. Anyway, on that list, we beat out all the heavy-hitters like Stanford, MIT, Duke, CalTech, Harvard, and Princeton. And so HMC presented students and alumni with shirts that said “The Most Amazing College You’ve Never Heard Of.” We were then bribed with free ipod nanos as prizes for a photo contest where we could wear our shirts and compete in various categories: best school spirit, most unusual location, best science-related, best fashion statement, best group/family/community portrait, and best photo with someone famous. Actually, alumni were bribed with free ipod nanos, students were bribed with restaurant gift cards. (They totally got the short end of the stick.) I currently have an ipod shuffle (my first one got stolen in the Philippines) but my ipod nano had gotten stolen in Thailand, and the generic cheapie ones I’ve bought seem to die quick deaths when bathed in sweat. So I really wanted to win an ipod nano! I figured my best shot was to go with “best fashion statement” since we Mudders have a reputation for being well… dorky. (Explains a lot about me, doesn’t it?) My first idea was to just wear the shirt and bodypaint and nothing else, but after taking the first round of photos I had a feeling my mother wouldn’t approve. So short shorts and high heels it was. Which is still more than what I wear when racing. You can see all the photo entries on HMC’s Facebook page. So guess what! I won! I won I won I won! Wait, you already knew that because I said at the beginning of the post that it was a prize-winning photo. I should really stop spoiling my own stories. Anyway, let it be known to all current and potential sponsors that I will totally bodypaint your logos all over myself. I am also happy to dye my hair to your company colors. 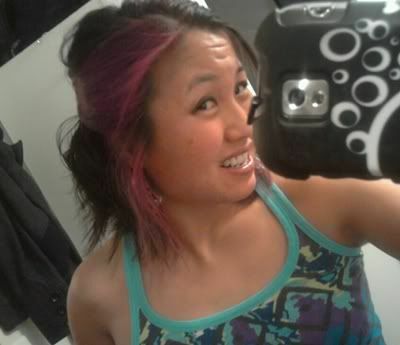 I got bored with purple, so the new flavor of the week is hot pink! 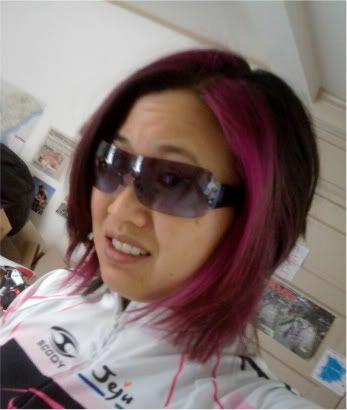 I haven’t had hot pink in my hair since I raced the Singapore 70.3 a whole two years ago…whew time goes by when you’re having the best time of your life! All right…that was just me saying the teamTBB photo shoot is not the same without this hot-pink-haired camera whore. And just doing my part to promote the most amazing college you’ve never heard of. So now you’ve heard of it! This entry was posted on Wednesday, March 23rd, 2011 at 10:23 am	and is filed under photos, shameless plugs. You can follow any responses to this entry through the RSS 2.0 feed. Both comments and pings are currently closed.